The objective of Team Up is to foster collaboration between academia and industry in the Brussels-Capital Region. The program involves active participation of both academic units and industrial teams with an aim of strengthening knowledge, transferring IP from academic research to the industry and turning it into prototypes that lead to new business opportunities. Thanks to Team Up, companies will acquire the knowledge they lack/require and integrate the state-of-the-art, while academics will find real-world use cases to apply their findings. 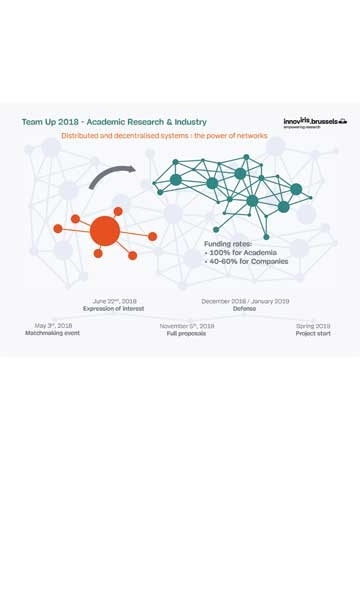 After a successful first edition dedicated to artificial intelligence, Innoviris is pleased to announce the second edition of its Team Up program. Distributed and Decentralised Systems - The power of networks. Enabled by technological progress, a shift from centralised systems towards distributed and decentralised ones can be observed globally. While centralised systems do all their processing in one place, distributed and decentralised systems split the processing among a network of (a potential high number of) nodes teaming up with each other. The most iconic example of such systems is the blockchain, but the current move away from centralised systems goes far beyond. Many sectors have crossed or are nearing the pivot point where more decentralized and distributed systems can compete effectively from the standpoint of both functionality and efficiency. Distributed and decentralised system can have a competitive advantage over existing centralised solutions. They offer greater scalability, greater resilience as well as other application-specific advantages. On the other hand, they are more complex to manage, raise security concerns and pose other challenges that the Team Up 2018 call aims at addressing. Every project encompassing a form of distribution or decentralisation is welcome. The project may concern the system as a whole or focus on a single element of it. Finally, the call is NOT restricted to ICT.